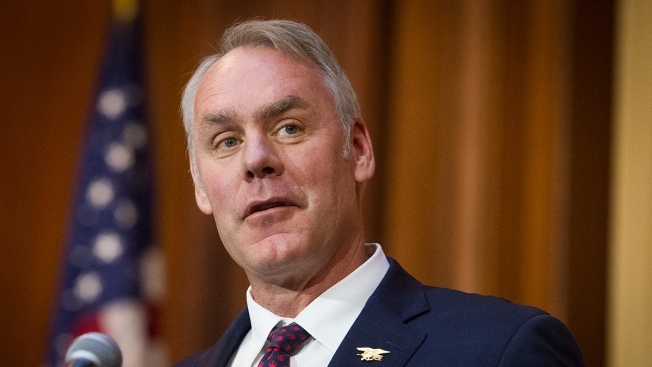 FILE - This Dec. 11, 2018, photo shows former Secretary of the Interior Ryan Zinke in Washington. Former U.S. Interior Secretary Ryan Zinke is quickly parlaying his time in President Donald Trump's cabinet into a lucrative private career. Separately, criminal statutes impose one- and two-year bans on various kinds of communications between senior federal officials and their former agency, said Virginia Canter, chief ethics counsel of Citizens for Responsibility and Ethics in Washington, a nonprofit ethics-watchdog.